Turtleback Books. SCHOOL & LIBRARY BINDING. 0613919645 New Condition. . New. Turtleback Books. SCHOOL & LIBRARY BINDING. 0613919645 Like New Condition. . Fine. New York: GRAPHITTI DESIGNS / DC COMICS, 1989. Graphic Novels. Illus. by GIBBONS, DAVE. As New. Hardcover. 1st Edition. HB - 1st. Print - FINE in FINE Slipcase (As New) (Watchmen smiley face embossed on black leather boards in matching black slipcase / No DJ as issued) - A stunning copy of the Graphitti Designs classic - With heart-felt characterization and an unprecedented level of storytelling sophistication, Watchmen redefines the comic book, the super-hero, and perhaps, fiction itself - Includes extra material; character profiles, sketches, and more... Note: Limited to 1000 copies. 1987-07-02. New. Ships with Tracking Number! INTERNATIONAL WORLDWIDE Shipping available. Buy with confidence, excellent customer service! DC Comics. Hardcover. 1401207138 Like New Condition. . Fine. 2009-03-01. Good. Ships with Tracking Number! INTERNATIONAL WORLDWIDE Shipping available. May not contain Access Codes or Supplements. May be ex-library. Shipping & Handling by region. Buy with confidence, excellent customer service! 2014-05-01. New. Ships with Tracking Number! INTERNATIONAL WORLDWIDE Shipping available. Buy with confidence, excellent customer service! 2014-07-03. New. Ships with Tracking Number! INTERNATIONAL WORLDWIDE Shipping available. Buy with confidence, excellent customer service! DC Comics. Hardcover. 1401207138 Please allow 4 - 14 business days for Standard shipping, within the US. Thank you for supporting our small, family-owned business! . Fair. 2011-12-13. Absolute. 1995-07-09. Good. Ships with Tracking Number! INTERNATIONAL WORLDWIDE Shipping available. May not contain Access Codes or Supplements. May be ex-library. Shipping & Handling by region. Buy with confidence, excellent customer service! DC Comics. Hardcover. 1401207138 Remainder mark . Fine. Paw Prints 2008-04-18. Library Binding. POOR. Noticeably used book. Heavy wear to cover. Pages contain marginal notes, underlining, and or highlighting. Possible ex library copy, with all the markings/stickers of that library. Accessories such as CD, codes, toys, and dust jackets may not be included. New York: Dc Comics, 2008. Graphic Novels. Illus. by Dave Gibbons. Fine. Hardcover. Signed Copy. First Edition/First Printing. A square solid tight clean un-read copy. Compilation edition that contains material originally published as Watchmen Issues #1-12. Basis for the movie, probably released because of it. This copy has been signed by Len Wein who was a co-editor of the original series. This copy includes a picture of Len at the signing event. 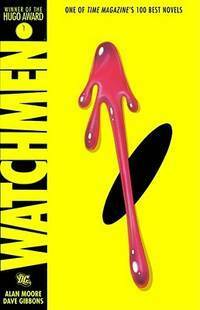 THIS COPY IS IN MY POSSESSION AND NORMALLY SHIPS NEXT DAY..
Alan Moore - Watchmen - Hardback. Book. BRAND NEW. DC Comics, 2008. Hardcover. New. 10.44 x 6.97 cm. DC Comics. Hardcover. 1401207138 *LIKE NEW* Ships Same Day or Next! . Fine. DC Comics. Hardcover. 1401207138 *BRAND NEW* Ships Same Day or Next! . New. DC Comics. Hardcover. 140128471X Please allow 4 - 14 business days for Standard shipping, within the US. Thank you for supporting our small, family-owned business! . Fair. 2019-03-26. DC Comics. Hardcover. 140128471X Please allow 4 - 14 business days for Standard shipping, within the US. Thank you for supporting our small, family-owned business! . Fine. 2019-03-26. DC Comics. Hardcover. 140128471X Please allow 4 - 14 business days for Standard shipping, within the US. Thank you for supporting our small, family-owned business! . New. 2019-03-26. DC Comics. Paperback. 0930289234 Please allow 4 - 14 business days for Standard shipping, within the US. Thank you for supporting our small, family-owned business! . Fine. 1995-04-01. Gph.